Hammersmith Farm (the Kennedy's summer White House) is awesome from the water. The main house in back is open to the public, but Jackie O's waterfront windmill is still used by her family when they stay in Newport. It's a lot bigger than it looks. 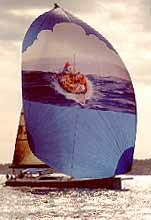 The light house on Rose Island is just outside Newport Harbor. Restored by the Rose Island Lighthouse Foundation, the museum also serves as a two-room B&B during the season. It's really noisy on Rose Island when the wild geese are nesting. But for someone looking for a remote adventure ... in Newport (10 minute water taxi to downtown). How did they build Clingstone on the rock? That's the question everyone asks. They say the yearly upkeep is a "little high." 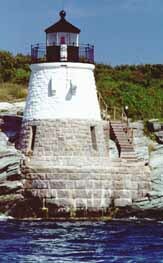 Castle Hill Light House, facing south out to the Atlantic Ocean, greets all who come to Newport by water. One of my favorite rocky places, it's well worth the visit down the stairs (if you have non-skid shoes and needs to be macho). 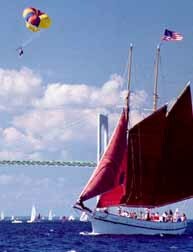 Just a typical sunny day off Newport Harbor, with a schooner on its two-hour sailing tour, a parasailer in the sky, more sailboats in the distance, and Newport Bridge in the background. And you wonder why Cap'n Vic hangs around Newport?